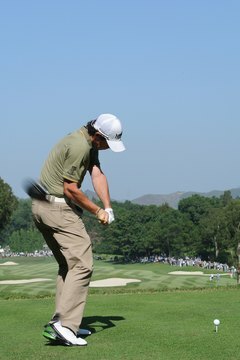 Rory McIlroy keeps his right elbow near his hip midway through the downswing. Your right elbow’s position during a golf downswing helps guide the clubhead along the proper swing path. If you keep your elbow too far behind your right hip, you’ll likely swing from the inside and push the ball. If your elbow flies too far from the body on the downswing, you’ll attack the ball from the outside and will likely hit a slice. Golf instructors offer a variety of hints on how to maintain correct right elbow position during the downswing. Left-handed players should read their advice in reverse to learn to correctly position their left elbows. The first step in preventing a misplaced right elbow is to establish the correct arm and shoulder positions at the top of your backswing. PGA pro Joe Thiel says there are four key right-angle positions to watch for at the top of the backswing. For example, your right elbow should be bent at a 90-degree angle. Additionally, the upper right arm should form a 90-degree angle with your chest, and your right forearm should sit at a 90-degree angle to the club shaft. Finally, an imaginary line between your shoulders should run perpendicular to the target line, forming the fourth right angle. Once you’ve achieved the proper arm positions at the top of your backswing, Thiel says to maintain the right elbow’s angle until your hands reach to about hip-level. You’ll then extend your arms as they enter the hitting zone. PGA pro Brant Kasbohm recommends that you focus on keeping your right elbow near the right hip during the downswing to avoid an “over-the-top” swing path in which your arms extend too far forward on the downswing, leading to a slice. 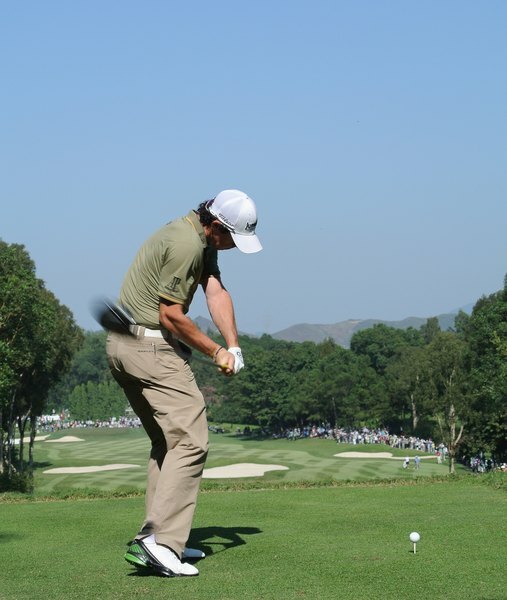 Bring your arms straight down as you begin the downswing, but stop when your hands arrive at hip-level. 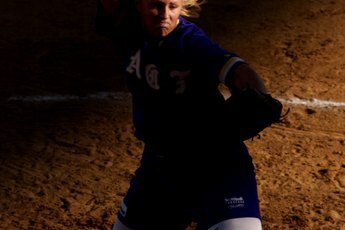 Your right elbow should be close to, and slightly in front of, your right hip. 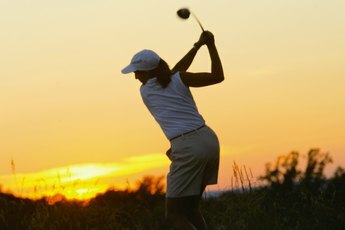 Golf instructor Randy Smith says to keep the elbow near the right hip by imagining that your right elbow is swinging down at the ball during the first part of your downswing. Golf pro David Leadbetter compares the elbow positioning during the downswing to the way a baseball player sets his hands to swing at a chest-high pitch. To hit such a pitch you must drop your right elbow lower than your left. This mimics the relative right elbow position midway through your downswing. Place a golf glove under your right armpit to help learn to keep your arms close to your body and prevent a flying right elbow during the downswing. Take partial swings to hit balls at a practice area while keeping the glove in place. Feel how your arms must remain close to your body, and how your arms and body must move together to hit the ball squarely. What Is the First Move in the Golf Downswing?